Reiki Center Team makes this possible. We are always grateful to them. Reiki Center and the many volunteers provide educational programs as well as demonstrations to the to the community such as corporate environment, community-sponsored wellness events, Organizational and Medical/Clinical Environments, as requested. During these events, information or PowerPoint Presentation (with speaker) is provided concerning how these modalities can offer amazing results coupled with essential oils, where applicable. The “Reiki Center Team” travel to the events and the feedback has been very rewarding to the volunteers. 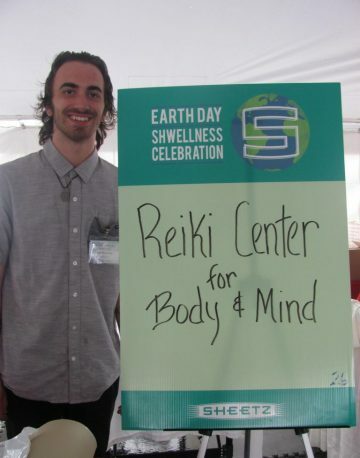 In 2016, Reiki Center and its volunteers traveled to three different counties attending over 35 wellness events and increase attendance each year. 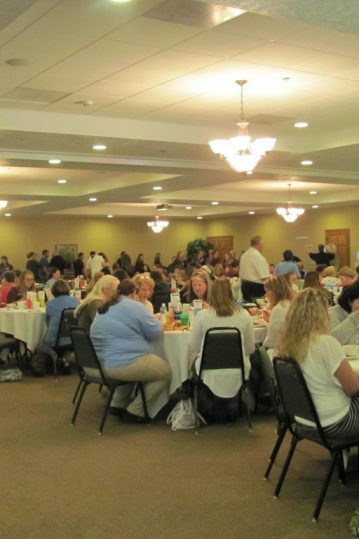 In 2018, the Center was at 61 different events within our community . The events have proven to be very effective with educating the different types of modalities and identifying basic needs of the body including air, water, nutrition and the importance of the body’s balance: mind and body. Franz is a Licensed Massage Therapist, Certified Manual Lymph Drainage Therapist and Certified Infant Massage Instructor for Parents and Caregivers. He is also a Jikiden Reiki® Practitioner and Western Reiki – Usui/Tibetan Reiki Ryoho Master/Teacher. Franz began his career life by earning his business degree as well as a Master Tool and Die Maker in Saarbrucken, Germany and was employed by SKF Industries in Germany and the United States. He retired from the SKF, Altoona Plant after 32 years and embarked on his journey and career. With his wife, Deborah, they began Reiki Center for Body and Mind, Inc. Franz continues to enhance his massage practice by addressing the needs of the clients and continual pursues additional educational opportunities. He offers his typical Therapeutic Massage and the following key specialized modalities: Myofascial Release Massage and Manual Lymph Drainage. Deborah Pecka is an natural health practitioner (Teacher of Natural Health) and Certified Natural Health Professional and Natural Health Specialist through Trinity School of Natural Health. She is a certified Eastern Reiki (Jikiden Reiki®) teacher and practitioner through the Jikiden Reiki Institute in Kyoto, Japan and as well as a Western Reiki Master/Teacher level. She is a Certified Infant Massage Instructor for Parents and Caregivers through the HypnoBirthing Institute. Deborah began her career in the banking industry and taught post-secondary education in business administration and medical office administration within an Accredited Career College environment then accepted the position as Director of Financial Aid. While establishing Reiki Center for Body and Mind, Inc., Deborah continued to increase her knowledge with Complementary and Integrative care and continued her responsibilities as the Director of Financial Aid. In 2013, Deborah resigned her position to become full-time owner/operator at the Reiki Center. 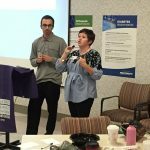 Deborah organizes and presents at various wellness events within the community to provide education of how the integrative care system can benefit individual quality of life. These presentations/speaking engagements offer a clear look of different modalities while the “Team” does demonstrations. She also organizes Staff Appreciation events, Corporate Wellness events and accepts clients at the Center. Tim is a Jikiden Reiki® Practitioner and teacher (Shihan Kaku) within the Jikiden Reiki® Institute in Kyoto, Japan. Tim is a Licensed Massage Therapist and travels with the Reiki Center to educate and demonstrate the Integrative Care system. His interests lie in natural wellness and that began at a very young age. Tim works with Reiki Center to present and demonstrate Reiki for our community and corporate events and continues his Reiki education through the Jikiden Reiki Institute Kyoto, Japan. Tim also instructs the community of the efficacy of essential oils. Jannett retired in 2007 from a very active professional life. Since retiring, Ms. Trexler became involved with Reiki Center through her training with Reiki for Caregivers and continued her Reiki training with Eastern Reiki and is a certified through the Jikiden Reiki Institute in Kyoto, Japan. 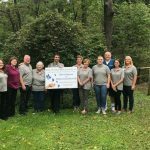 As such, she has become involved in volunteering throughout the central Pennsylvania area, assisting with demonstrations of Reiki at Health and Wellness Events giving Reiki sessions for both public and private programs. Ms. Trexler was instrumental created a Reiki Clinic at a local long term/short term care facility in Hollidaysburg, PA. One day each week, Reiki practitioner volunteers provide Reiki relaxation sessions for both residents and staff: 368 sessions were documented. Mark Johnson is the owner of a video production company in Hollidaysburg, PA. For over 25 years, he has provided the community with professional production of videos. After years of interest, he studied to become a Reiki Practitioner. His interest in Reiki grew, and he is now a Reiki Master/Practitioner and is an Eastern Reiki practitioner certified through the Jikiden Reiki Institute in Kyoto, Japan. He is an integral part of the Team provides services to those within a local cancer center. Mark continues to run his successful video production company and welcomes his Reiki clients. 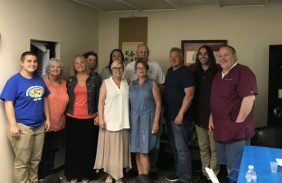 The Reiki Team presented to the Pain Management Group and demonstrated to participants – Thank you Mark Johnson and Jannett Trexler for all your help. 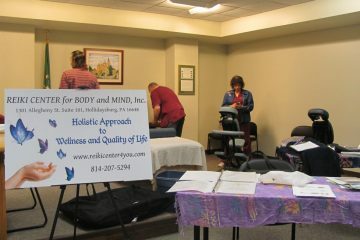 Deborah, Tim, and Mark present the benefits of Reiki within the Corporate Wellness Program offered at the Reiki Center.